Now that I have access to an awesome interlibrary loan system, I set the goal of reading all the 2017 YA National Book Award finalists. First up: American Street by Ibi Zoboi. What's fun is that I am going into these books with no background, so I didn't even realize it was about a Haitian teenager. I have an affinity for books about Haiti, so was excited to dive in. Fabiola and her mother left Haiti for a better life with their family in Detroit, but when her mother is detained at the airport, Fabiola must continue on her own. Thrust into a life with three wild older cousins, she must quickly adjust to American life. Soon, she is over her head and willing to set someone up for a crime in order to protect her family. But all actions have consequences. 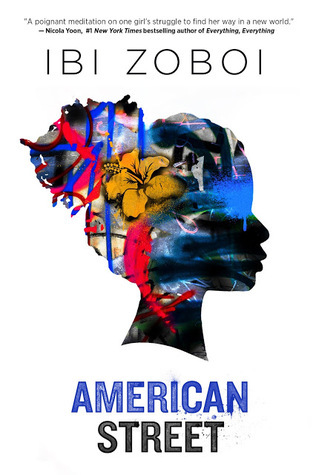 I enjoyed American Street and was happy that Fabiola wasn't a saint; at times Haitian protagonists are written as too innocent and good. I liked how she stayed true to her Haitian roots, but thought there was less focus on her mother than one would expect. I was left with questions about her aunt, about how much the girls knew about their father's death, and about what happened at the end. Still, it was a worthwhile read and a good start to my National Book Award readathon.